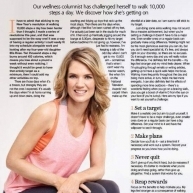 My monthly column for Health & Wellbeing magazine talking about my tips to help you be healthy, happy, and stay in shape! This month it's about my challenge to walk 10,000 steps a day.... have I managed to stick to my target? ?